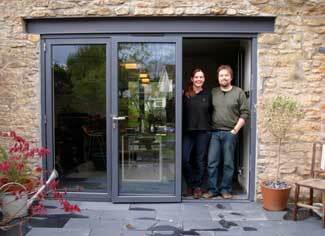 Our Somerset bi-fold doors customers come from far and wide, but naturally, with Somerset bordering Bristol, the county contains many homeowners who have asked us at Bristol Bifold to give their home the bi-fold door WOW factor! We get enquiries right across Somerset, from Taunton, Wells, Street, Bridgwater, Yeovil all the way up to Bath, so you can be comfortable that you're not alone in Somerset! 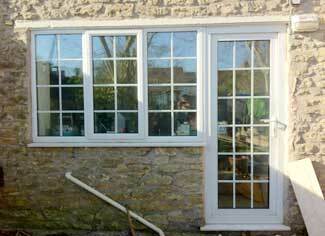 We've installed a lot of bifolding doors across Somerset, including Aluminium bi-fold doors and Composite bi-fold doors. The fitters were friendly, polite and efficient and obviously took great pride in their work. We are delighted with the doors allowing us to open up the dining end of the kitchen ready to enjoy the summer! We love the quality of the upgraded brushed steel door furniture we chose. We were pleased with the slate grey aluminium doors we chose to compliment the slate flooring we have run through the kitchen and out to the patio. We are now working on landscaping the garden and considering replacing some the windows on the rear elevation of the cottage to match our doors. We're still putting the finishing touches to the inside and waiting for some sunshine! Not only have our new doors transformed the appearance of our home, they have also transformed the way we live in it. We spend all our time in our new kitchen/dining room. Have You Seen What Our Home Looked Like Before!? Where Is the showroom in relation to Somerset? The bifold door showroom is just over 20 miles from the centre of Bath and only an hour away from Taunton. Not far at all to see our range of high quality bifold doors and sliding doors. Just a short trip up the M5, our showroom is within easy reach of any homeowner in Somerset. Please feel free to visit our showroom. Get a quote from one of our friendly advisers by calling 0117 900 0667 or email us here. You can find the best route on the map below by putting your postcode into the directions box under the map. After clicking on the 'Get Directions' button, your directions will magically appear!